Welcome on board, Geert Keirens! The director of the Brussels Airport umbrella organisation Air Cargo Belgium (ACB) has become CargoForwarder Global’s 15,000th sub. His enrolment comes nearly three years after we welcomed Don Cochran, former President of general sales agent Platinum Air Cargo USA, now part of ATC Aviation, as our 10,000th sub. Geert has been an airport and air cargo aficionado for over 30 years. Apart from his position at ACB, he is also Project Manager Airport at the Chamber of Commerce of Halle-Vilvoorde, the region in which Brussels Airport is located. Last but not least, he is the general manager of the Flanders Aerospace Training Center in Ostend. 1961-born Geert holds a Master of Science in Biology, but he has worked in the aviation and airport industry his entire professional life. “I took a holiday job at Brussels Airport right after my graduation and I have never left,” he notes. Over the years, Geert has acquired a taste for a wide range of specific tasks within the aviation industry, so it seems. “I was a load master for passengers, a load master for cargo, a dispatcher and a warehouse manager.” So he’s learned the aviation ABC from scratch. After a 2-year trip round the world, he became Station Manager for ground handler Belgavia, the present Aviapartner, between 1996 and 2001. 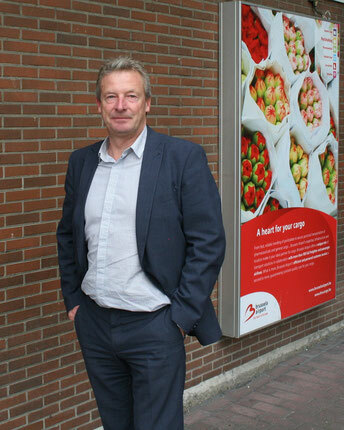 In 2001, he was appointed Station Manager Cargo and, a year later, Director Cargo Brussels-Ostend-Antwerp. In 2010 he became Director Passenger Handling and in 2011 Handling Manager. “At Aviapartner I have always had the opportunity to build a career,” he recalls. Brussels Airport also enjoyed a growing popularity with the full freighter operators, especially from the Middle East and Asia-Pacific, like Saudia Cargo, Cathay Pacific and Eva Air. Geert: “Brucargo developed a unique concept in creating a hub for these carriers. However, its importance decreased over the last few years particularly after Saudia Cargo decided to relocate their freighter flights to AMS.” Meanwhile traffic is picking up again, thanks to Ethiopian Cargo and others. Brucargo, too, went through a lot of changes, bringing both ups and downs. “In the beginning, over 30 years ago, the dynamism was unparalleled.” But gradually the initial enthusiasm waned, he recalls, ending up in a sort of insular mentality as time went by. Today, however, the dynamism has returned, Geert feels, and the founding of ACB is a first peak. “We are focussing on nice markets like perishables and pharma. We also want to be a forerunner in digitalisation. To achieve this, we need to build a strong community. I am pleased that both my experience and the energy I have allow me to have a hand in building that community.” To date ACB has 55 members. Its working groups are supported by over 70 people. The organisation is managed by a staff of 5, including Geert Keirens.